You must be a member of COGS, or a guest of a member, to participate in field trips. Become a member of COGS today! Please arrive at the field trip meeting location 5-10 minutes early to get signed in. Check the weather report and plan accordingly. Remember that weather conditions can change quickly in central Oregon! Dress in layers and wear sturdy hiking shoes. Bring plenty of water and snacks, pack a lunch if specified in the field trip description. Please leave your pets at home – dogs are not allowed on COGS field trips. Thursday, April 18, 2019, 9 am-1 pm. Saturday, April 27, 2019, 9 am-1pm. Within Shevlin Park are exposures which reveal more than 600,000 years of Central Oregon geologic history. Three ash-flows have come out of the Cascades west of Bend. Between eruptions, streams have cut channels into earlier ash-flows and those channels helped guide the flow of later ash-flows and lava flows. The current route of Tumalo Creek began forming around 300,000 years ago when a lava flow filled the previous channel east of Shevlin Park. About 170,000 years ago, another ash-flow swept across the area. A portion was channeled down the Tumalo Creek drainage where it thickened and welded to form what is now known as the Shevlin Park Tuff. Continued erosion by Tumalo Creek has cut a channel through the Shevlin Park Tuff to exposes the older Tumalo Tuff and Desert Spring Tuff. Total walking distance will be about 2.5 miles with about 200’ of elevation gain on a combination of trail, road and a minor amount of off trail surfaces. This trip should be suitable for all geological backgrounds. Each trip is limited to 12 participants. To sign up, please contact Derek Loeb by email at DerekLoeb@gmail.com and please provide a cell phone contact number and indicate which session you prefer and whether you are flexible. The Deschutes Formation ranges in age from approximately 7.5 to 4 million years old and consists of volcanic deposits and associated sediments that were predominately sourced from the east flank of ancestral High Cascades. While the Deschutes Formation is present over a large portion of the upper and middle Deschutes Basin in the greater Bend area, to the south it is buried under younger volcanic deposits sourced from the Cascades Range to the west and Newberry Volcano to the south. North of Bend the Deschutes Formation comprises much of the surface geology and is especially well exposed in the canyons of the Deschutes and Crooked Rivers and Whychus Creek. The Deschutes Formation is of particular interest because, not only is it the best way to understand the evolution of the ancestral, High Cascades, but it serves as the major groundwater aquifer in the area. This field trip will visit a section of the Deschutes River near its confluence with Whychus Creek that is representative of the range of lithologies that make up the Deschutes Formation and its transition from being dominated by volcanic rocks to the west and transitioning to a much greater sedimentary composition to the east. It features exposures of the Deschutes Formation, intra-canyon basalts, baked paleosols, sedimentary features, wild flowers and great views. This will be a good introduction to those who are not familiar with the Deschutes Formation or these outcrops, and for those who are, this is a good chance to become reacquainted and engage in some lively geo-discussions. This COGS field trip will explore several iconic examples of hydrovolcanoes in central Oregon. Hydrovolcanoes are produced by the interaction of magma or magmatic heat with an external source of water, such as a lake or an aquifer. After cinder cones, hydrovolcanoes are the second most common volcano type on continents and islands. The most common structure produced by a hydrovolcano is either a tuff ring or a tuff cone. 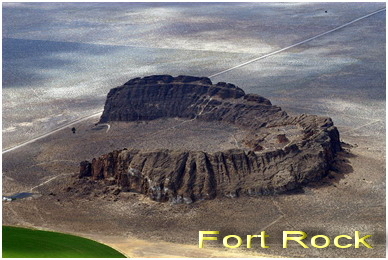 We will visit three locations that exhibit these structures: Hole in the Ground, Fort Rock, and Table Rock. Each of these volcanoes erupted explosively within or near the ancient Fort Rock Lake. The rocks at each stop tell an amazing story, so we’ll learn how the volcanic processes are unraveled at the outcrops. This will be a long day with considerable driving time. The driving time from Bend to the first stop at Hole in the Ground is approximately 1¼ hours, and the return to Bend from the final stop at Table Rock is under two hours. The roads in and out of Hole in the Ground are the roughest of the trip, and roads at Table Rock are also quite rough. A high-clearance vehicle is highly recommended. Bring a lunch, plenty of water, and ensure that your vehicle has a full tank of gas prior to leaving. The only gas station or store along our route after La Pine is in Silver Lake, following the last stop. We will leave for the field trip at 8:00 AM from the southwest corner of the Walmart parking lot, 20120 Pinebrook Blvd., Bend. Please plan to meet 15 minutes prior to departure. The return to Bend should be no later than 6:00 PM. To register, please contact Steve Goldberg directly via email at baetis1@me.com, indicating if you have a suitable vehicle and if you would be willing to provide room for others. An effort will be made to match participants with the most capable vehicles. Given the road conditions and access, the trip will best accommodate about six vehicles. The Crooked River caldera is a 26-mile long, 17-mile wide volcanic depression formed through a series of super-volcanic eruptions between 29.7 and 27.5 million years ago. Eruptions from the Crooked River caldera deposited massive volumes (>140 cubic miles) of tuff and rhyolitic lavas, dikes, and domes. All of these volcanic features are now well exposed in the rock walls of Smith Rock State Park. Current research suggests that the Crooked River caldera records some of the oldest caldera-forming eruptions related to the passage of the Yellowstone volcanic hotspot from the coast of the Pacific Northwest to the modern Yellowstone caldera in Wyoming during the past 50 million years. The Crooked River caldera also contributed a significant amount of volcanic material to the Turtle Cove Member of the John Day Formation, which hosts one of the world’s most complete and well-preserved fossil records of Cenozoic terrestrial plants and animals. This field trip will be led by Jason McClaughry from the Oregon Department of Geology and Mineral Industries. 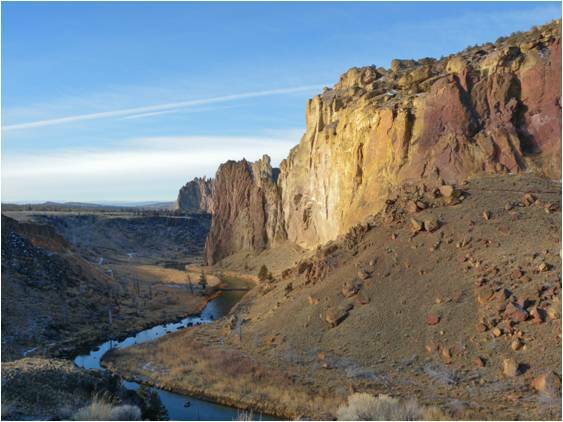 The trip is appropriate for all levels of geologic background, but will emphasize in-depth discussions of the volcanic processes that created the Crooked River caldera. Total walking distance will be less than 2 miles, mostly on flat terrain but some stops may include short walks over uneven ground. McClaughry J.D., Ferns, M.L, Gordon, C.L., and Patridge, K.A. (2009). Field trip guide to the Oligocene Crooked River caldera: Central Oregon’s Supervolcano, Crook, Deschutes, and Jefferson Counties, Oregon. Oregon Geology, Volume 69, No. 1, pp. 25-44. McClaughry J.D. & Patton, P. The Oregon Encyclopedia: Smith Rock State Park. Few places contain as remarkable a record of long-term climatic and biotic change as the John Day Basin of Central Oregon. 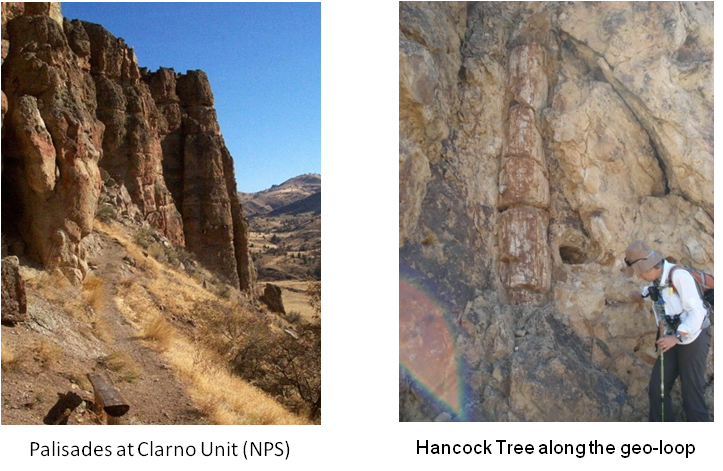 On this trip, we will visit the Clarno Unit of the John Day Fossil Beds National Monument, located about 90 miles NE of Bend (~2 hours drive-time). As described on the NPS website, the Palisades are the most prominent landform and are volcanic lahars, or mudflows, that formed 54-40 million years ago in a lush semi-tropical rainforest environment. Tiny four-toed horses, huge rhino-like brontotheres, crocodilians, and meat-eating creodonts that once roamed ancient jungles are now found in the rocks of the Clarno Unit, as well as an incredibly diverse range of plant life. Leaves, fruits, nuts, seeds, and petrified wood from 173 species of trees, vines, shrubs, and other plants have been found here thus far. 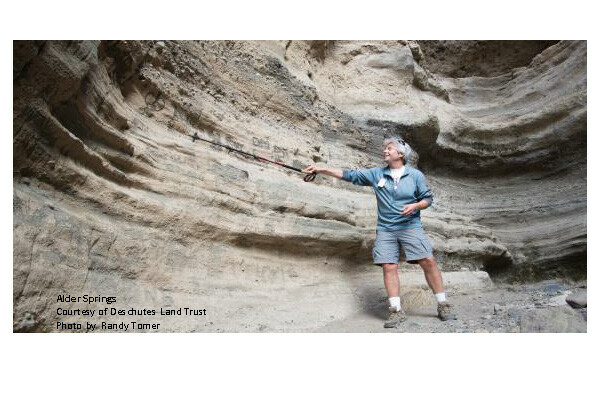 This trip, led by Bob Timmer & Derek Loeb, will focus on the volcanism, sedimentation, paleo-climate, and flora & fauna recorded in the Clarno Formation. We will depart Bend at 8:00AM and arrive at the Clarno Unit picnic area along highway 218 at about 10AM. After an overview of the geology and a bathroom break, we will then drive 1 mile west to the parking area at the Hancock Field Station. We will hike the geo-loop trail past the Hancock Tree, to the Ignimbrite Rim (basal welded tuff of the John Day Formation), the Mammal Quarry, the Nut Beds, and Red Hill. The hike will be about 4 miles with an elevation gain of about 700 feet. Lunch will be along the trail and we should return to the cars by 3PM. We will then return to the Clarno Unit picnic area to meet members of the Geological Society of the Oregon Country (GSOC). They are holding the Presidents Field Trip at Clarno (Hancock Field Camp) and we will join them at the picnic area for refreshing beverages and snacks before departing by 4PM for Bend. We should arrive back in Bend by 6PM. Temperatures at Clarno can range from quite warm to chilly in September, dress accordingly, bring plenty of water and sunscreen, and bring a sack lunch. This trip should be suitable for all geologic backgrounds. A restroom is available at the Clarno picnic area. Please send an email to DerekLoeb@gmail.com to register or for more information and include a cell phone number. Participants need to be a member of COGS or guest of a member and please leave your pets at home. Participation on the trip will be limited to 12 per our permit from the National Park Service. 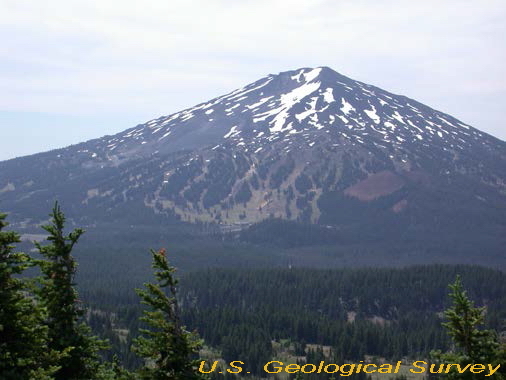 The Mount Bachelor volcanic chain is a 25-km long zone of shield volcanoes and cinder cones that erupted over several millennia during and after the end of the last major Pleistocene ice age. Despite the relative short duration of activity, eruptions of the chain emplaced about 40 km3 of lava flows and fragmental deposits, a volume that is similar to that of the Three Sisters and Broken Top combined. On this field trip we will discuss the age of the volcanic chain, relation to glacial events and deposits, tectonic influences, eruptive styles, and the petrology and geochemistry of eruptive products. We will also consider the importance of eruptions like the Mount Bachelor chain to growth of the central Oregon segment of the Cascade volcanic arc. This field trip will be led by Cynthia Gardner and William Scott, both from the U.S. Geological Survey—Cascades Volcano Observatory. The trip is appropriate for all levels of geologic background, but will emphasize in-depth discussions of the volcanic history of the central Oregon Cascades. Total walking distance will be less than 2 miles, some of which may be over uneven ground. Scott, W. E. & Gardner, C. (1990). Field Trip Guide to the Central Oregon High Cascades, Part I: Mount Bachelor-South Sister Area. Oregon Geology , 52, pp. 99-117. I’ve worked with the USGS since 1980 (starting as a Physical Science Technician) and began working in volcanology in 1983. My major projects include volcanic history (using paleomagnetic-secular variation techniques), eruptive processes, and volcanic hazard studies in the Cascades (Baker, Bachelor, Mount Hood and Mount Shasta), at several Alaska volcanoes (Redoubt, Spurr, and Augustine), and in Nicaragua (Momotombo, Telica, and Cosequina). I’ve participated in five eruption responses, Redoubt Volcano, Alaska 1989-1990; Crater Peak, Alaska, 1992; Soufriere Hills, Montserrat, 1995; Mount St. Helens, Washington, 2004–2008; and Kilauea, Hawaii, 2018, and am especially interested in the start and endings of eruptions. I also enjoy working with emergency managers to hopefully prevent future volcanic crises from becoming volcanic disasters. 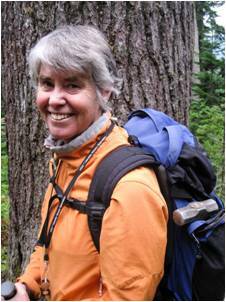 I was the eruption coordinator for the Mount St. Helens 2004–2008 eruption and was Scientist in Charge at USGS’s Cascades Volcano Observatory from 2005–2010. 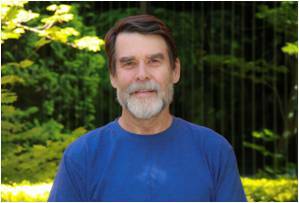 I’m a Geologist Emeritus since retiring in 2015 after a 40-year career with USGS. My major projects include volcanic history, eruptive process, and volcanic hazard studies in central Oregon, at Mount Hood, and several Alaska volcanoes; investigations of eruptive processes and hazards at erupting volcanoes including Mount St. Helens, 1980 and 2004-present; Redoubt Volcano, Alaska, 1989-90 and 2009; Mount Pinatubo, Philippines, 1991-92; and Soufriere Hills, Montserrat, West Indies, 1997. Fields of interest include volcanology, volcano-hazard assessment, and volcanic-risk mitigation. Between 1997 and 2003 I served as Scientist in Charge at USGS’s Cascades Volcano Observatory. The Quaternary Period ranges in age from about 2.6 million years ago to the present. Within this time period, numerous cycles of major glacial advances and retreats occurred. This is also a period when active volcanism in the High Cascades interacted with alpine glacial activity. During the last glacial stage from about 115,000-12,000 years ago, volcanic and glacial interactions resulted in much of the modern land forms of the High Cascades that are so familiar and appreciated today. The theme of this field trip will be to examine these land forms and to discuss the volcanic and glacial processes that produced them. We will meet at 9 am at the Ray Benson Sno-Park, near Santiam Pass off of U.S. Hwy 20. After introductions and orientation we will discuss how glaciers have interacted with the High Cascade volcanos. With Hayrick Butte in clear view, this area is one of the best places in the world to examine a specific type of interaction of volcanism and glacial ice which results in a landform called a tuya. We will then proceed east on Hwy 20 to the Mt. Washington Overlook pull off. Here we will enjoy a great view of Mt. Washington, but most importantly we will be able to envisage what the glacial accumulation zone and alpine glaciers would have looked like during the last glacial advance. We will also get a good view of Blue Lake, which is a post glacial, hydrovolcanic feature which sits within the larger Suttle Lake basin. Suttle Lake is a moraine-dammed lake that is just out of sight from this location. Our final stop will be further east on Hwy. 20, past the northern shore of Suttle Lake, to FS 12/Jack Lake Rd. where we will park near the bridge over Lake Creek. Here we will use a little imagination to see the terminal moraine of Suttle Lake. We will hike about a mile, ascending its lateral moraine, before arriving at the recessional moraine that dams Suttle Lake. Here we will enjoy a lunch break with shade and a view of the lake. After a summary of what we have observed and interpreted, we will discuss features that are further downstream, for example the braided streams and outwash plains. We should arrive back at our vehicles by 3 pm. Total walking distance on this trail is about 2 miles and an elevation gain/loss of about 200 feet which will be mostly in the shade. It should be suitable for all geologic backgrounds. Please send an email to DerekLoeb@gmail.com to register or for more information and include a cell phone number. Participants need to be a member of COGS or guest of a member and please leave your pets at home. 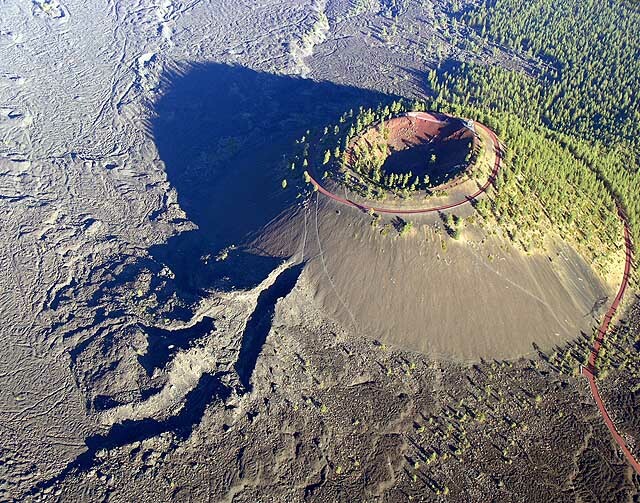 Lava Butte is a ~7,000 year old cinder cone located on the flanks of Newberry Volcano. It is the northernmost vent along the Holocene “northwest rift zone,” a nearly continuous zone of mafic vents and lava flows that extends about 20 miles from the north wall of Newberry Caldera. The Lava Butte eruption began along a fissure that became localized and built the 500-foot cinder cone. The eruption also produced spatter ramparts, extensive lava flows, and an ash deposit. These features provide good examples of the types of eruptions that have occurred throughout the past on the flanks of Newberry Volcano and throughout the central Oregon Cascades. From the splendid vista on top Lava Butte, we will examine the products and processes of cinder cone eruptions, and discuss the hazards this type of volcanic activity poses. After exploring the summit of Lava Butte, we will visit the Lava Lands Visitor Center at the base of the cinder cone and take a short walk through the lava flow on a paved trail. This field trip will be led by Daniele McKay and will focus on the volcanology and hazards of cinder cone eruptions. The trip is appropriate for all levels of geologic background, and all physical abilities. Total walking distance will be about 1 mile on generally flat trails. Temperatures on the lava flow trail can be quite warm in July, dress accordingly and bring plenty of water and sunscreen. There is a restroom and water at the visitor center, and a restroom with no water at the summit of Lava Butte. We will meet at the shuttle bus stop on the east side of the Lava Lands Visitor Center at 8:45 AM. There is a $5 fee per vehicle for the visitor center and Lava Butte. A Northwest Forest Pass will allow you access without paying the vehicle fee. There is an additional fee for the shuttle service to the top of Lava Butte. The cost is $2 per person round trip and exact change is required. BRING $2 IN CASH FOR THE SHUTTLE – EXACT CHANGE IS REQUIRED. This field trip will visit two sections of Whychus Creek that are representative of the range of lithologies that make up the Deschutes Formation and its transition from being dominated by volcanic rocks to the west and transitioning to a much greater sedimentary composition to the east. 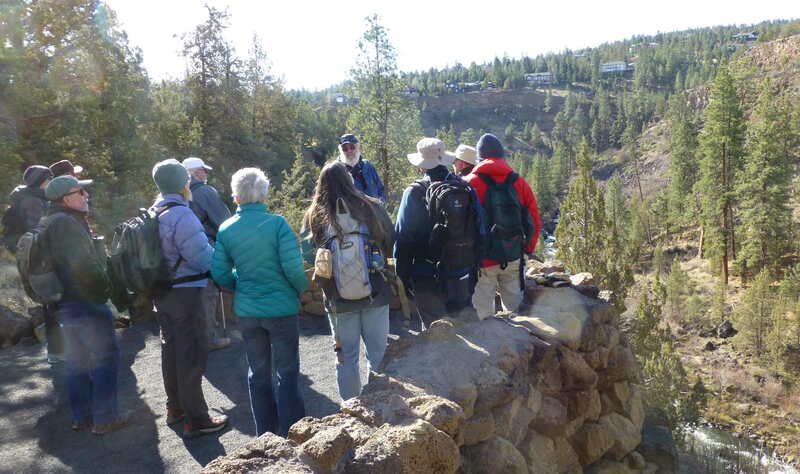 The first stop will be at Whychus Canyon Preserve, owned by the Deschutes Land Trust, where we will do a fairly level, 1-mile hike to an outcrop and viewpoint that is representative of the volcanic facies of the Deschutes Formation. We will then drive to the Alder Springs trail head, on the Crooked River National Grasslands, and do a 3-mile hike with an elevation change of 400 feet to the banks of Whychus Creek. Along the way we will see numerous outcrops showing the transition to the sedimentary facies of the Deschutes Formation and its importance as an aquifer.